We’ve partnered with Vlasic® to bring you 10 great low-calorie ideas for after school snacks. From zero calorie snacks like Vlasic® dill pickles to sweet berry smoothies that hide a full serving of spinach, you can feel good about feeding your kids these quick and easy after school snacks! Cut up three cheese sticks into 15 1/2 inch pieces. Cut 7-8 Vlasic® sweet gherkins pickles or Vlacic® Snack’mms pickles in half. 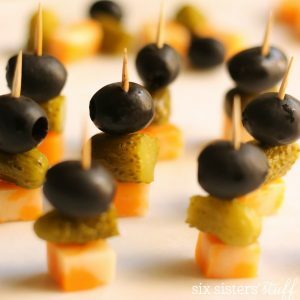 For each kabob, thread 1 olive, 1 pickle piece and 1 piece of cheese on a toothpick. Serves 3. Take 1 cucumber, peel it, slice it in half, and scoop out the seeds. 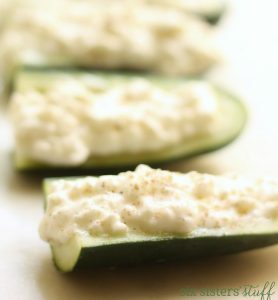 Fill each half with about a 1/2 cup of low-fat cottage cheese. Top with salt and pepper to taste. 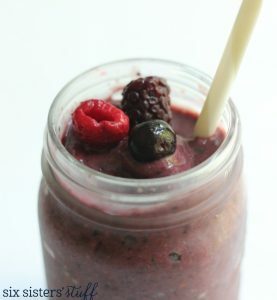 Add 1/2 cup apple juice, 1 cup spinach, 1 banana, and one cup frozen mixed berries in a blender and blend until smooth. Add water to reach desired consistency. Serves 2. 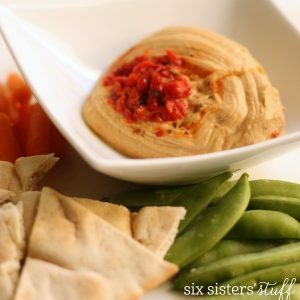 Serve hummus with your favorite sliced vegetables. We love peppers, sugar snap peas, carrots, and celery. Wash 5 celery stalks and cut them in half. 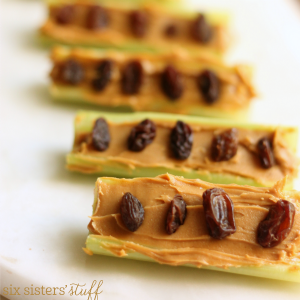 Spread the inside of each celery piece with 1-2 tablespoons of your favorite nut butter (we love peanut butter and almond butter). Top with Raisins and serve. Serves 5. See the easy recipe HERE. 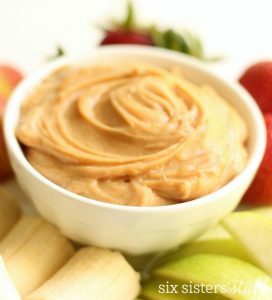 Mix together 1/2 cup strawberry yogurt, 1/2 cup peanut butter, and 1/4 cup powdered sugar until it is smooth and creamy. 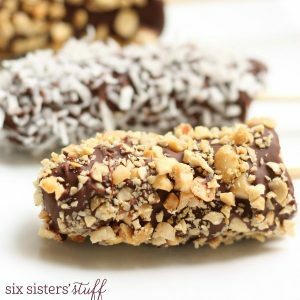 Serve with your favorite fruits (we like this with apples and bananas). Serves 4. 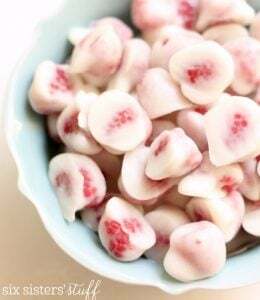 Wash 1-2 cups of raspberries and let them dry completely. Place a sheet of wax paper on a cookie sheet that will fit in your freezer. Taking a toothpick, dip raspberries in greek yogurt (I used vanilla flavored yogurt). Place on wax paper, and transport to freezer using cutting board to help with the transfer. Freeze completely and serve cold. Place a piece of turkey on a piece of lettuce. Spread a dollop of mustard on the turkey slice. Place a Vlasic® pickle spear (cut in half length-wise) in the middle of the turkey slice. Roll it up and secure it with a toothpick. Slice up a cucumber into 1/4 inch rounds. 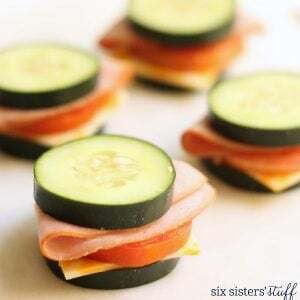 Between two cucumber rounds, stack cheese, tomatoes, and deli meat (and anything else you like on your sandwiches). Serve cold. 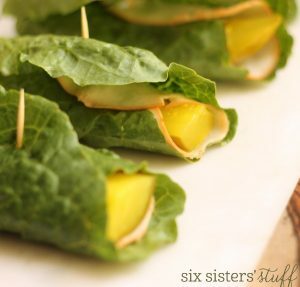 Looking for more low-calorie snack ideas? Check out all the products Vlasic® has to offer! You can also follow them on Facebook, Twitter, YouTube, and Pinterest. I love the frozen yoghurt raspberries one! I usually do mine with blueberries or grapes and it's so absolutely satisfying. Really nice list!